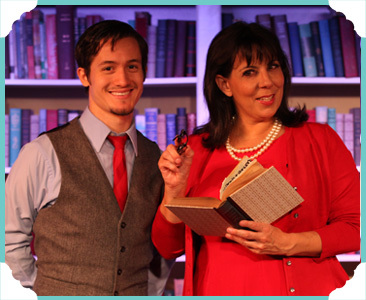 CHRISTINE PEDI (Miss Abigail) is doing double duty off Broadway playing MISS ABIGAIL and starring in NEWSical the Musical at the Kirk Theatre on 42nd Street (spoofing current affairs, trends and cultural phenomenon.) December it's TRIPLE duty when THERES NO BIZNESS LIKE SNOW BIZNESS, her annual holiday show, returns to the Laurie Beechman Theatre for it's 4th consecutive year. She was recently part of THE MAD SHOW at the York Theatres Musicals in Mufti series and Project Shaws FANNIES FIRST PLAY at the Players Club. Christine has a long association with the satirical revue FORBIDDEN BROADWAY and a Drama Desk nomination for FORBIDDEN HOLLYWOOD having played both shows in New York, London and around the world. On Broadway she's been in TALK RADIO with Liev Schrieber and LITTLE ME with Martin Short and Faith Prince. Fans of HBOs THE SOPRANOS may recognize her for her pivotal role as Mrs Bobby Baccala. (4 scenes, 5 lines ... dead. BUT he loved her so much he couldn't defrost her ziti for months!) Her multi award winning cabaret act GREAT DAMES has played New York, London, South Africa and all over the US. She's been a featured soloist on the QM2, Avery Fisher Hall and with symphonies across the country. Christine can be heard daily on SiriusXM Radios ON BROADWAY channel 72 (9a-3p ET Mon- Sat) playing the music of the stage and screen and interviewing theatre legends. ChristinePedi.com. ISAAC CRUZ (Paco) has a BFA from the American Musical & Dramatic Academy and has appeared on television as a guest star of "Law & Order: Criminal Intent". His next TV appearance will be on the Discovery ID show "Evil I". Isaac wishes to thank Davenport Theatrical, all audiences and his mother for this fantastic opportunity. KEN DAVENPORT (Co-Author): Broadway productions include Godspell, Chinglish, Oleanna starring Bill Pullman and Julia Stiles, Speed-the-Plow, Will Ferrell's You're Welcome America, Blithe Spirit starring Angela Lansbury and 13, as well as Altar Boyz, My First Time, The Awesome 80s Prom, and Miss Abigail's Guide to Dating, Mating, & Marriage Off-Broadway. He also recently released These Magnificent Miles: On the Long Road with Red Wanting Blue, a documentary on one of the top unsigned rock bands in the country. Ken was featured on a national commercial for Apple's iPhone and named one of Crain's "40 Under Forty." Combined, Ken's productions have grossed more than $100 million worldwide and are being produced internationally in over 25 countries including Germany, Mexico, France and Korea. He created and developed the Broadway board game Be A Broadway Star, recently seen on "The Today Show," and a smartphone app called AT THE BOOTH™, which gives a listing of available shows at the famed TKTS® booth in Times Square. AT THE BOOTH™ has been featured on Entertainment Weekly's "Must List" and called "Ingenious! The best thing to happen to New York theater since, well, the introduction of the TKTS® booth!" He also runs a number of theatrical websites including DidHeLikeIt.com and YourBroadwayGenius.com. Current projects include bringing the first ever revival of A Few Good Men to Broadway and adapting the novel and film Somewhere in Time into a Broadway musical. His blog, TheProducersPerspective.com, has been featured in Vanity Fair, New York Magazine, The Gothamist and more. He has written articles for Forbes, Mashable, Imedia and others. For more information, visit www.DavenportTheatrical.com. DTE, Inc. I Illustration by GlenHanson.com I Photos by Carol Rosegg.